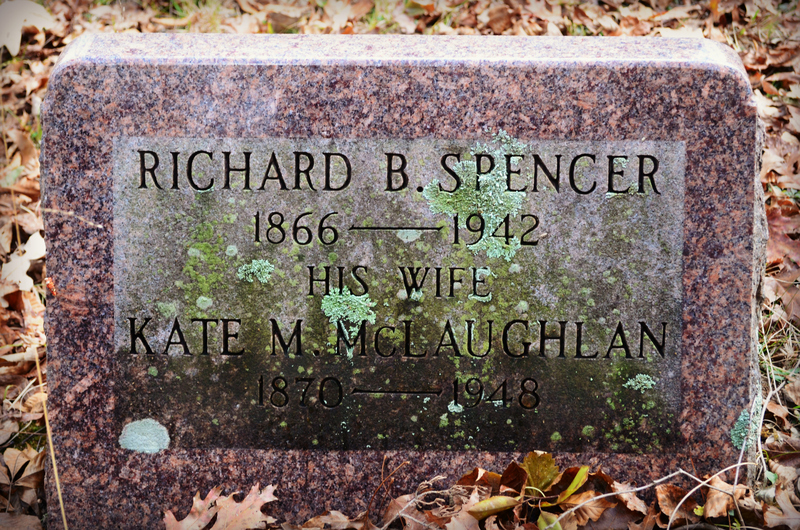 To distinguish this Richard from his paternal grandfather “Deacon” Richard–who he was obviously name after–and other Richards in the Spencer ancestry, he was called “Burn”, according to Audrey Mae’s mini-biography. The markings on his shared gravestone (No. 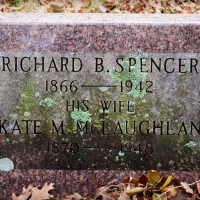 14) with his wife show that he married Kate M. McLaughlan (1870-1948). It is not clear from Audrey Mae’s mini-biography whether Kate is the daughter of Dora or whether “Burn” and Kate had a daughter named Kate. More research is needed. The author of this site does not know the history of Kate McLaughlan and her family of origin. According to Audrey Mae, Richard Burnside’s father is Joseph Jason (No. 9) who is the fifth child of Richard Anthony (“Deacon”) (No. 6) and Roby (née Tarbox) (No. 5) Spencer. Richard Burnside’s mother is Celinda Kettelle who is Violet Kettelle’s great aunt. Cousin Violet, as Audrey Mae called her, was the first woman to enter Penbroke College in Rhode Island. Violet taught school in Vermont for most of her long career. (glossary of audreymaespencer.com). On retirement, Violet returned to her family home on north side of Middle Road in East Greenwich, R.I., to the east of the Spencer family cemetery. Violette spent her retirement years at her family home on Middle Road and Audrey Mae (3-19-1912–3-11-2007) would often visit Violet on the Kettelle farm. Audrey Mae wanted all her daughters to know cousin Violet who was a woman before her time. Violette had said that she could no longer visit her own family historical cemetery as the brush had grown up and concealed the graveyard, and it was too difficult or impossible for her to any more find it, never mind visit it. According to Audrey Mae, Augustus Burnside (gravestone No. 24) is also a child of Joseph Jason and Celinda and therefore, he is another brother of Richard Burnside. Augustus Burnside died as a child of three years. The author of this website does not know why Augustus Burnside’s gravestone is not near his siblings’ gravestones.